Great price for fresh fish!!! Picked up 4 today! You need a £1 fish! Make sure is gutted, Bought some Trout on Sat and the both of them were … Make sure is gutted, Bought some Trout on Sat and the both of them were not gutted, If i had of know I would of left them at the counterNOT HAPPY !!!!!!!!!!!!! So you were gutted that the fish wasn't? £4 is the usual price. Its half price this week! Don't normally shop in Morrisons, so I will pop in and follow my nose. Hopefully I won't end up in the gent's bogs though. If you are not prepared to gut it then you should not be eating it. Don't normally shop in Morrisons, so I will pop in and follow my nose. … Don't normally shop in Morrisons, so I will pop in and follow my nose. Hopefully I won't end up in the gent's bogs though. Only takes a minute or two to gut a fish with a pair of scissors. Less work than cleaning one's teeth in the morning. 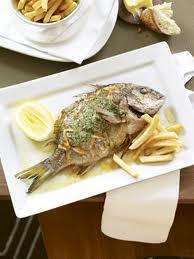 I am not much of a fish eater but always want to try more - anyone suggest a good way to cook? Favourite Recipes? I am not much of a fish eater but always want to try more - anyone … I am not much of a fish eater but always want to try more - anyone suggest a good way to cook? Favourite Recipes? Very easy to gut and I'm sure the fish counter would have done it for you had you asked. Same price in Asda atm btw. I would of asked them to be gutted, if i had of know they were not. They are sold on weight so if gutted you are not paying for that, Besides, ASDA always gut there fish and they cheaper, and who said if I am not prepared to gut them i should not eat them, I guess they will want me killing horses next and selling to Tescos for they burgers !! STUPID COMMENT !!! EWELL !!! I need to be going to your Morrisons!! I would of asked them to be gutted, if i had of know they were not. … I would of asked them to be gutted, if i had of know they were not. They are sold on weight so if gutted you are not paying for that, Besides, ASDA always gut there fish and they cheaper, and who said if I am not prepared to gut them i should not eat them, I guess they will want me killing horses next and selling to Tescos for they burgers !! STUPID COMMENT !!! EWELL !!! Not a stupid comment at all. If you are not prepared to kill or prepare any meat or fish then you really should not eat it. If more people adopted this approach then there would be far less food wasted by our gluttonous society.